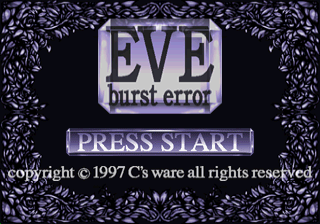 Eve Burst Error (イヴ・バーストエラー) is a 1997 adventure game by C's ware for the Sega Saturn. It was a visual novel created by a team consisting of Hiryoki Kanno and Ryu Umemoto; they previously created Desire, and later joined Elf, where they created Kono Yo no Hate de Koi wo Utau Shoujo Yu-No. It was originally released for the PC-98 in 1995. It was followed by EVE The Lost One. Main article: Eve Burst Error/Magazine articles. EVE_ABS.TXT TXT (Abstract) 205 About this game. Note:Disc1-4 are included same content.